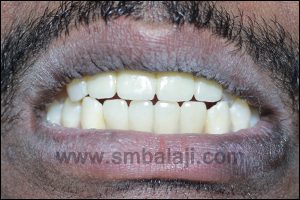 A patient of age 43 years who had visited multiple dental clinics looking for an immediate and cost effective solution for his oral rehabilitation; visited our hospital seeking the expert opinion of Maxillofacial Surgeon and Implantologist Dr. S. M. Balaji. 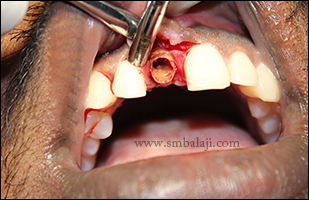 The patient complained of several missing and mobile teeth in the upper arch. The patient explained about his difficulty to chew foods and that he was experiencing a stutter. 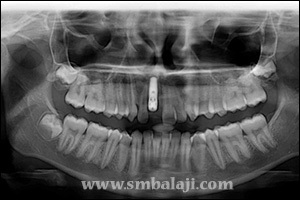 After thorough clinical and radiological examination, Maxillofacial Surgeon and Implantologist Dr. S. M. Balaji planned to perform complete extraction of the periodontally weak maxillary teeth followed by immediate implants placement along with zygoma implants, thereby providing a graft less and affordable alternative for tooth replacement. 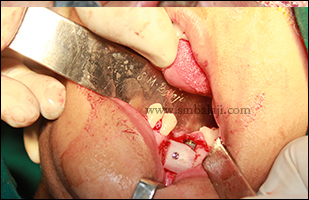 All the maxillary teeth were extracted and dental implants along with zygomatic implants were placed. 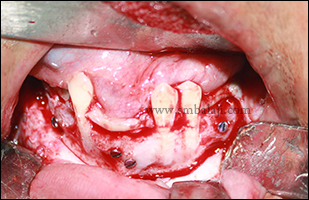 The zygomatic implants were placed by creating a window on the lateral wall of the sinus; the sinus mucosa was lifted away from the area where the implant would pass through; ensuring not to penetrate the membrane. After a period of 3 months, complete osseointegration of implants with the alveolar bone was achieved and cosmetically well blended fixed ceramic prosthesis was placed onto the implants. 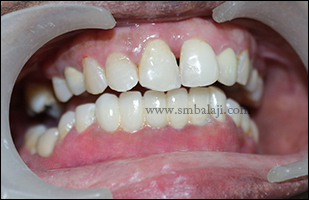 The patient was greatly overjoyed to have a complete smile makeover using dental implants and also stated that he experienced an immediate change in his speech after placement of the prosthesis. 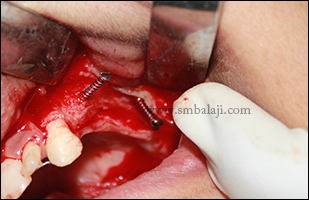 Keywords: Zygoma implants, implants, graft less technique, cheekbone implants, immediate implants. 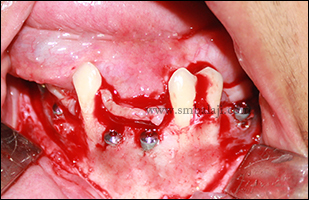 Pre-operative showing periodontally weak teeth. 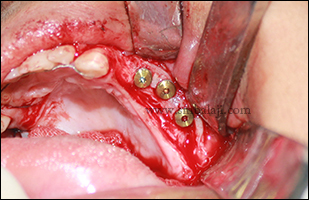 Post-operative OPG with zygoma implants. 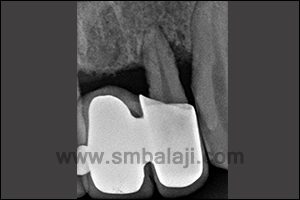 A 30 year old man came to our dental clinic with the complaints of fractured upper front teeth due to an accident. 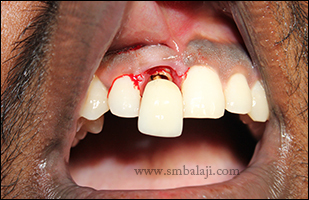 After thorough clinical and radiological analysis, Maxillofacial Surgeon and Implantologist Dr. S. M. Balaji successfully removed the fractured upper front teeth without damaging the supporting teeth structures. 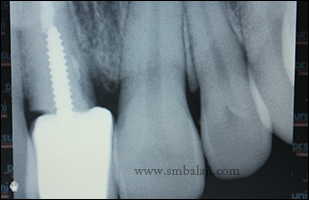 Immediate dental implants were fixed into the extraction sockets with good stability and retention. 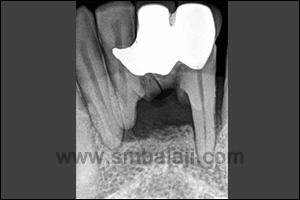 Following complete osseointegration of implants with that of the alveolar bone cosmetically well blended fixed ceramic prosthesis was given. Patient feels very happy to have permanent fixed replacement for his broken teeth and complete smile makeover with the ceramic prosthesis. 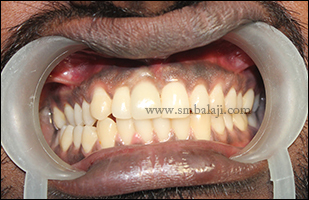 This is a case of periodontally weak lower anterior teeth replaced with dental implants. She reported to our hospital with the complaint of severely mobile teeth. 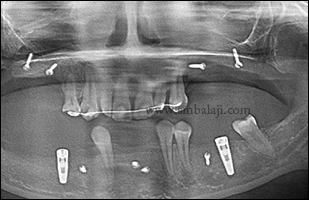 After thorough clinical and radiological examination, Maxillofacial Surgeon and Implantologist Dr. S. M. Balaji planned to do extraction and replacement with dental implants in single sitting. 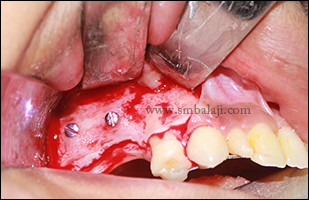 Mobile teeth were extracted and replaced with immediate dental implants. 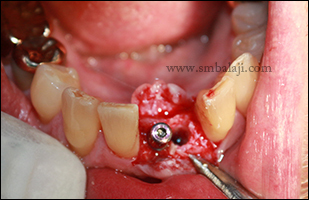 After complete osseointegration of implants with that of the alveolar bone, cosmetically well blended fixed ceramic prosthesis were placed onto the implants. A patient reported to our dental clinic wanting to remove a broken tooth in her upper front teeth region due to failed prosthesis done following endodontic therapy elsewhere. She also requested a permanent replacement of the same. 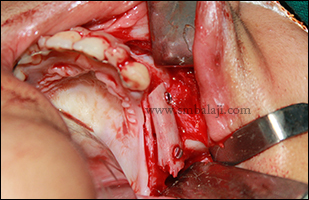 She was advised to undergo an extraction of the tooth which was badly broken. 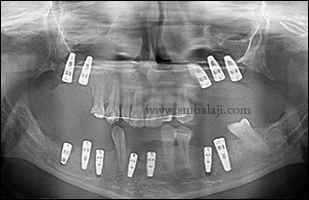 Eminent Maxillofacial Surgeon and Implantologist, Dr. S.M. 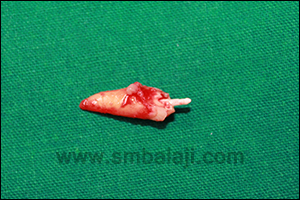 Balaji, renowned for his expertise in dental implantology, successfully extracted the fractured endodontically treated tooth without damage to the supporting bone and an immediate dental implant was placed right away into the socket of the extracted tooth. Following complete osseointegration of the dental implant with that of the alveolar bone cosmetically well blended fixed ceramic prosthesis loaded onto the implant which improved her smile dramatically. A 26 year old lady reported to our dental clinic with the complaints of pain in upper front region of jaw due to failed endodontic treatment done elsewhere. 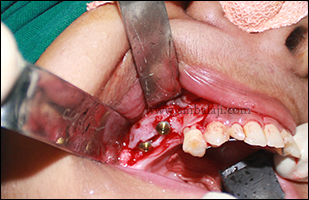 She wanted to replace the tooth with dental implant. 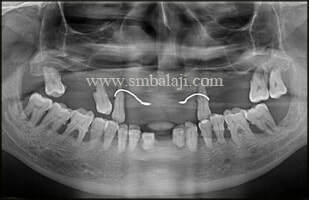 After thorough clinical and radiological examination, Maxillofacial Surgeon and Implantologist Dr. S. M. Balaji successfully planned to remove the infected teeth and replace it with immediate implants. 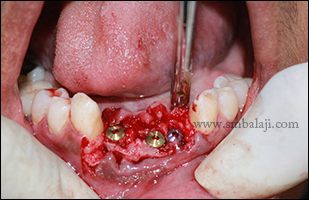 Infected upper central incisor was extracted without any damage to the adjacent tooth structure and immediate implant was placed into the extraction socket with good stability and retention. 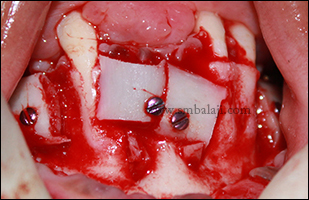 After complete osseointegration of dental implant with that of the alveolar bone, implant was loaded with fixed ceramic prosthesis giving naturally well blended appearance. 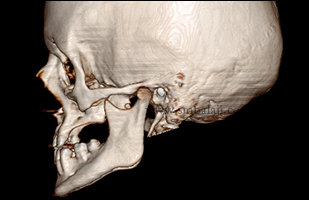 A 26 year old boy visited our hospital seeking for correction of his facial profile to enhance the appearance. He was under orthodontic treatment for past 2 years elsewhere. But he was not satisfied with the results and thus he wants to have surgical correction of his jaw without any scars on the face. 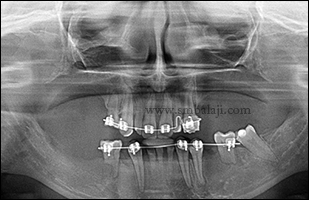 After thorough clinical and radiological examination, Maxillofacial Surgeon Dr. S.M.Balaji planned to correct his face by following corrective jaw surgery. 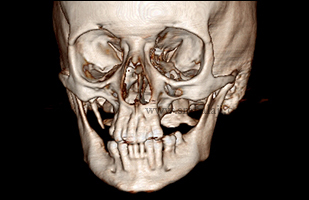 He has short upper lip due to vertical maxillary excess which was corrected by Lefort I osteotomy. His profile shows short chin giving round face appearance. 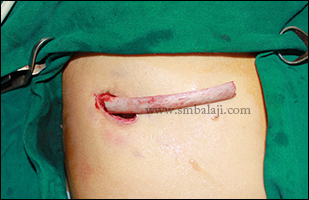 This was corrected by augmenting the genium using costochondral rib graft. Thus entire surgery was done inside the mouth and his facial appearance improved dramatically. Patient feels very happy to have the entire facial correction in a single surgery and without any visible surgical marks on the face. 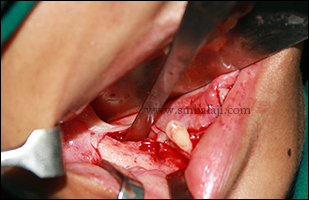 A 24-year-old girl reported to our dental clinic seeking to replace her upper teeth. 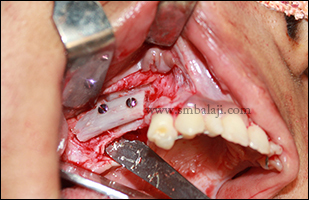 She added the canine and first premolar teeth was removed elsewhere due to infection few months back. 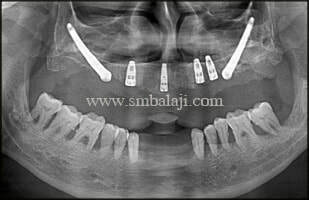 Maxillofacial Surgeon & Implantologist Dr. S.M. 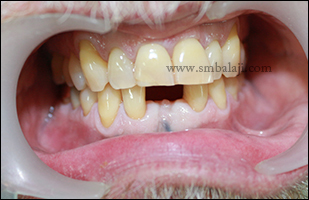 Balaji skillfully placed dental implants in the missing teeth region in the left side of upper jaw. 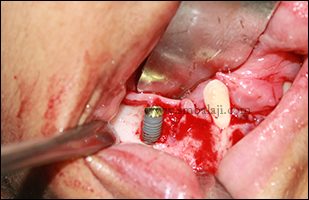 After successful osseointegration, ceramic prosthesis was fixed to the implants. She was extremely happy with the results and to have a dazzling smile with the complete smile makeover. 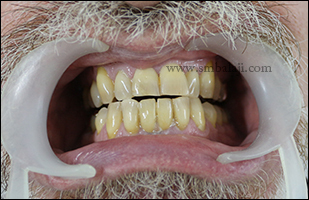 A 45-year-old man from Dubai came to our dental clinic seeking to replace his missing lower front teeth. 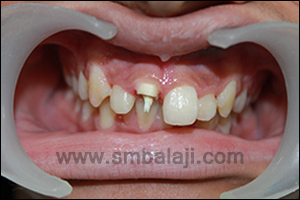 Few months back he had suffered a fall injury in which his lower central incisor teeth were severely fractured and subsequently extracted. The gap in his lower teeth gave him an unsightly smile. Also it was difficult for him to speak clearly and bite into foods. 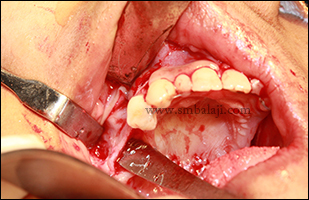 He wanted a fixed replacement without damage to the adjoining teeth. After thorough clinical and radiological examination, Maxillofacial Surgeon & Implantologist Dr. S.M. 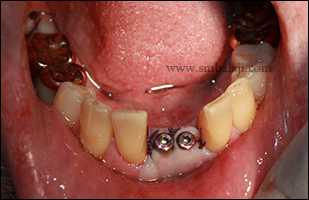 Balaji placed dental implants in the missing teeth region with good stability and retention. After complete osseointegration of the implants with the surrounding bone, ceramic crowns of exact color match were fixed to the implants. 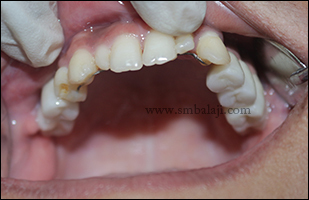 The patient is very happy to have a natural-looking smile and to be able to bite and speak well. 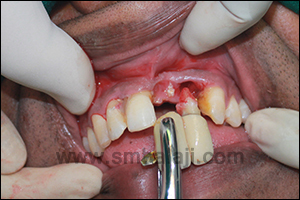 A patient reported to our dental clinic wanting to remove the teeth with excessive mobility. He also requested a permanent replacement of the same. 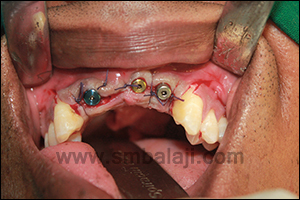 He was advised to undergo an extraction of the upper and lower anterior teeth which have severe mobility due to lack of supporting structures. 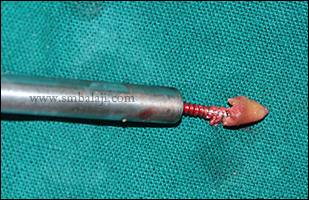 Eminent Maxillofacial Surgeon and Implantologist, Dr. S.M. 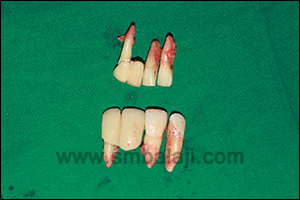 Balaji, renowned for his expertise in dental implantology, extracted the severely mobile teeth and immediate dental implants were placed right away into the socket of the extracted tooth. 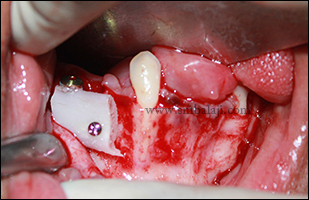 Fixed ceramic prosthesis was given following osseointegration after 3 months.